He looks like a nice enough guy, right? A friend recently asked me what my family does about Santa. I usually don’t talk about this because it can be such a hot-button topic. As I was answering her, I realized I had learned a lot as a parent about the link between Santa and our children’s spiritual well-being. The older I get, the more God has freed me from my tendencies toward legalism. He has not released me from my firm view on Santa however, and I will tell you why. At first it was our youthful legalism and perfectionism as new parents that kept us from playing the Santa game. Christmas was about Christ. No discussion. When my husband and I did talk about it, we felt dishonest setting up all the back story that comes with Santa. Also, we knew that we couldn’t do “naughty or nice” based presents. We knew we would give our kids presents regardless of their behavior. We also found that we liked letting them know we had thoughtfully and lovingly chosen their gifts. If it is the thought that counts, the thought was ours, not Santa’s. My opinion on this doesn’t matter one bit compared to what the Bible teaches. I know it doesn’t say anything about Santa, but if we look at our calling as parents, certain problems present themselves. We are called to lead our children to their Creator and His plan for being reconciled to Him. That plan is found in the person of Jesus Christ; a man they can not see with human eyes. We tell them they have to believe and have faith. This is the same kind of talk that comes with Santa. Only one day, they will find out the life-altering, innocence-shattering truth; you can’t really see Santa because he is not real. He couldn’t see you when you were sleeping and he had no idea if you were bad or good. He doesn’t exist. It is easy to see how their childlike faith in an invisible Jesus, an extremely precious treasure, can be confused by this revelation. Atheists already use this argument to plant doubt in the minds of whoever will listen. The posters in this article are produced by Atheists and they would exploit any angle to “free” your children from the religion you have “brainwashed” them with. To me this amounts to a foothold for the Enemy. Gospel of Jesus Christ, this issue is so important. We are saved by grace through faith. Grace means the gift of God is not earned by behavior nor prevented by bad behavior. It is merely accepted or rejected by humans but always freely given to us, while we were yet sinners! Connecting your approval of your child to your child’s behavior teaches the exact opposite. Both you and God love your child unconditionally. The rules of Santa fly a huge sleigh right in the face of all we want them to believe. Grace is so hard for humans to grasp anyway. The concept of grace is important enough to let it shape the details of how you raise your children. This is especially true for a holiday that is supposed to be about the birth of Jesus and God’s plan to extend his amazing grace to us. This rant must be extended to the Elf on the Shelf. Do you really want to teach your children that the eye-in-the-sky is watching them and Christmas is all about whether it sees them do good things or bad things? Do you want their motivation for being good to be the promise of presents or the fear of less presents? Have any one of us ever given our child a lump of coal? You know their behavior will not affect your list or it certainly shouldn’t. Gifts are unconditional. That is why they are called gifts, not rewards or wages. Teach them this biblical economy and you are sharing the unconditional love of God. It’s really beautiful when you think about it. I know it is easy for me to say all this when I never started pretending about Santa in the first place. If you already play Santa, prayerfully consider how you can do it without the conditional presents and the convincing tricks. We do the Tooth Fairy, but very tongue-in-cheek and with a wink. Everyone has always known she is me because she falls down on the job so often. I don’t deceive them but we play at it. 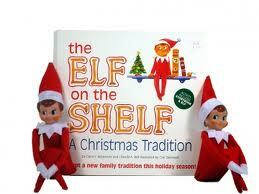 So, let your elf on the shelf get into mischief in the night if you want (by the way, why doesn’t he have to be good?) but don’t let him be their conscience or the family stalker. If you are just get started with your Christmas traditions, consider not doing Santa at all. The only real trick to that is making sure they never tell other children. That’s not their job. 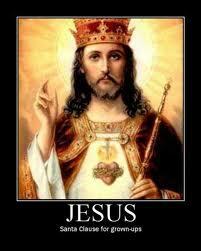 Above all, keep Jesus the focal point of your Christmas. My mother always hosts a birthday party for Jesus on Christmas Eve. This is a great way to have fun and point out to your children that the Giver of all good gifts lets them blow out the candles and open the presents on His birthday. He’s just that awesome. You can not go wrong driving home that message while you are raising His child. In keeping with the title of this post, please share your views on Santa and how you work it out at your house. Don’t hold back your opinion but be good….for goodness sake. This entry was posted in Christian living, Holidays, parenting styles by lookmom. Bookmark the permalink. Those are all good points. I agree with them even though we “do Santa.” It was never really a concious decision, we just sort of carried on family tradition, but it has never really been emphasized at our house. Santa is sort of an “also ran” at Christmas time. We do everything we can, by God’s grace, to pass on our faith to our kids 365 days a year. We are emphatic about our decision to make Christ the Lord of our lives and try to live out that faith in front of them. Our oldest has already been told the truth about Santa, and I don’t think she connected it in any way with what we had told her about Jesus. It’s sort of a playful thing from us, much in the way the tooth fairy is at your house. Our youngest does believe in Santa, but he hardly gets a mention. She definitely knows why we celebrate Christmas, and it has nothing to do with old Saint Nick. When we revealed the truth to our oldest, we let her know the historical background of Santa, and that Mom and Dad “are” Santa, and that gift giving was a reflection of God’s gift to us, Jesus. They know we are joking about naughty and nice, they are gonna get presents no matter what. Now as to Elf on the Shelf- that would make even me paranoid! So we don’t do that one.Thanks for tackling this issue. Good stuff! There is a Santa…St. Nicholas. I agree with Jennifer – you raised some very good points. My parents also handled Christmas in the same way you treat the Tooth Fairy. They never hid the fact that they were Santa, so it was more of a playful thing than something any of us actually believed in. The most we ever did was leave out cookies and it was a “haha we know grandpa is eating them” kind of thing. The focus was always on the birth of Christ…I can’t remember for sure, but I know for a few years we had a manger scene instead of a tree. Or it may have been both. I can remember in elementary school there were always a few kids who would lose it if someone told them Santa wasn’t real. Seems like you’re setting them up for some ultimate disappointment…and then, if they believed Santa was real for most of their little lives, what are they going to think about other things you tell them are “real”? Of course this is all just my personal opinion, and I don’t even have kids yet. Thanks for your input ladies. We played at Santa when I was growing up. We knew not to leave cookies and milk because my dad doesn’t like milk. Our “Santa” got cookies and coffee. excellent truths… I had a conversation with a friend who told me her daughter used the fact that she’d lied about Santa and the tooth fairy to deny God’s existence. God is pretty clear about 2 things, we aren’t supposed to lie and we aren’t supposed to worship Him in pagan traditions which Christmas clearly is… Now, lets talk about Easter which is clearly a bad example of us totally blowing one of God’s holy days…Passover. That one needs to change back to His day and His alone! *facepalm* You do know that Easter is a Pagan holiday based on a god of fertility, don’t you? Do some real research. When trying to indoctrinate the Pagans, Christians took over their holidays and “filled in the blank” so to speak. The Christians’ own holidays lost their true days and eventually their meanings as well. This is exactly why my sister and law and I created our book: My Secret Angel and Me, How the gift of Christmas came to be. Our book comes with an angel doll instead of an elf. We do include Santa but show him kneeling and praying to God. God is the boss of Santa. The homage is given only to God in this book. We have taught our children the true reason for Christmas and, at 4 and 6, they can tell you the story of Jesus’ birth and that it was so important that “the whole world” (we’ll explain the actual details of that when they’re a little older) celebrates His birthday. We’ve pointed out that our birthdays are for our family to acknowledge; Christ’s alone initiates a worldwide party…the biggest party of the year, really. We try to make our Christian values and beliefs central in our day-to-day lives as well, through church attendance, prayer, and the application of God’s Word on our daily decisions. We believe in passing the JOY of our Savior on to our children: the joy of grace, the joy of love, and the joy of obedience. Now, all that being said, we “do” Santa, and we do it up big. I LOVED believing in Santa. I loved the magic and the expectation, the idea that once in the year, everyone I knew believed in something that was so crazy. When I found out the truth, I was disappointed, sure, but that truth didn’t turn me into an embittered misanthrope who doubted anything she’d ever been taught. You mention the “life-altering, innocence-shattering truth”, but I don’t think it has to be such a big deal. Sure, life-altering and innocence-shattering happen, but I don’t think they come from Santa. And as long as my kids are still innocent and unfettered by the realities of child molestation, genocide, and serial killers, I’d love for them to believe in some magic. And, as for our Elf (yep, we have one named “Booker”), he is just an extension of that magic. I guess, for me, confusing magic and the rock-solid foundation of truth that is JESUS is just unthinkable. 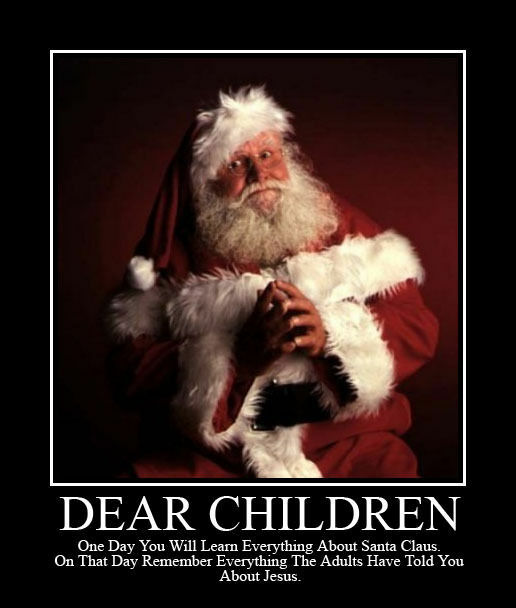 I am praying that my children’s experience with Santa will be similar to my own, a mere bump on the maturity highway. I hope I don’t have to report back in five years, my mouth full of elf-flavored crow. Thanks for stopping by and for sharing your thoughts on how you work it out at your house. I love to hear from people who are reading the blog. I love the idea of the world-wide party! Yes Virginia, there is a Santa Claus…..
We do the same in our house. My 4 and 6 year old believe in Santa but they are fully aware that Jesus is the most important part of Christmas . They don’t confuse the two thankfully. I have been writing about Drawing the Line at Christmas. We don’t “do” Santa either. He’s just a fun imaginary character that people like to play pretend with. That’s what we tell the kids. Right! I have enough little messes and troubles from the real people here. Thanks for stopping by. I cannot agree more. We have been completely open with our children on this subject. We have even told them that other children will believe in Santa and not to crush their hopes by telling them otherwise. They do get their pictures with ‘santas’ at Christmas, but they know it’s just a guy dressed up. It’s fun to watch a child who knows the truth talking to the ‘santa’ because he isn’t sure how to handle it. =) I enjoyed your blog and am really glad to hear from someone who thinks the same as us. Also, great points on how it effects our understanding of grace. Keep up the good work. Also, our children can tell you the whole story of Jesus but can’t say much about Santa except that he isn’t real. Thanks for the nice words and for stopping by! That is a crucial concept you have here, and very powerful. Because outside of a religious context, you are describing the “nature of things”. Is that Grace? Omnipresence is perhaps the most difficult and abstract intellectual thing for us to get our heads around for us humans. We feel like we are “all in this together”, we feel like the way we think is how everyone else thinks. So, when it comes to Jesus, (use an open mind here because this is hard to describe) we are personifying everything of a belief and values system into something tangible. He walked on Earth in our form (again, I am a newbie on this). When we are very young, we like to think that we are uncorrupted. But then there is original sin which is really the same thing as your inherited genes. We are not born with a clean slate, sadly. But we do have to learn the ways of our western world, and that, is what innocence and defenselessness is. You said this in a much better way with a story. So, to bring it full circle. 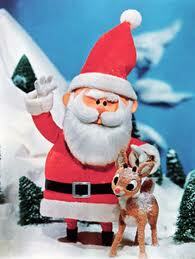 There is alot of research on how santa was turned into this corrupted proxy of the christian belief system. And, it the same co-opted manipulation for personal gain that is in every system we learn to cope with in order to be functioning adults. In this case, it is market capitalism. In other cases, it is social totalitarism in eastern europe “everyone is watching you” , it is dictatorial patrimony in Franco’s Spain, it is having to live during the French Revolution (perhaps the worst place and time to have lived on). So it is hard to teach the wisdom of religious faith, as you much better described. I mean, really teach it, to an innocent and unexperienced kid. We use stories, we use fables. Santa and his elves are the base fears, the base mistrust, the base manipulation at it’s worst in a dead simple reward system. But, the things you need to understand to become an adult in the modern world, in fact, in our materialistic society, is Santa and his Elves. They represent the “western civilization” that fundamentalists despise. You can take the wise and hard approach of teaching moral wisdom, or, you can take the connivence of Santa and his Elves to teach it. The difference between the 2 is that with Santa, you are teaching your kids to distrust you right out of the gate. You are telling your kid that they are stupid and that you lack respect for them. My kid is 4, but, I imagine it doesn’t take to long, or, an older brother, to set them straight. So do I want my kid to think I am stupid when he is 6, or when he is perhaps at least mostly through teenage years? But learning about “the human eyes” when you are real young (but not as Santa and his Elves, or maybe) is the biggest lesson we learn to become an adult. “Grace” gives you the inner faith and the moral compass. In fact, “the human eyes” are what lead to the crucifixion. We never did ‘Santa’ with our children. We have told them the historical story of St Nicholas and the importance of giving to others in need. We also do not have anything to do with ‘Elf on the Shelf.’ Our main reason isn’t legalism, but staying away from deception. I just do not believe it is healthy to deceive our kids – even in fun. Our kids know that we give them the gifts. They also know how to play with others and not tell the secret to those children who believe in Santa. Our children are still young and do enjoy seeing the ‘Santa’ at the mall, but they know it’s just a nice guy dressed in a costume. They also know that he represents the spirit of giving and that the best gift of all time was that of Jesus Christ. Good article! Thank you! It’s good to hear from families who are thinking through what traditions they initiate. You’re welcome. Thanks for sharing this information with us. I had heard of the elf but it didn’t really come up until this year. We have done the Santa thing but my 6 year old figured all the characters (Santa, Easter Bunny and Tooth Fairy) out so she knows the truth. My 4 year old still believes. I almost wish I could backtrack a few years and not even get into it. My daughter came home from school talking about the elf and I explained that it was a game and we don’t have an elf and were not going to get one for our house. I kid you not within 24 hours my Mom bought one and decided to do it at her house with my kids. This really upset me. She posted on facebook how great it is because my daughter had stopped believing but now thanks to the elf she is starting to believe again. I am very upset by this. I was raised in a Christian home by Christian parents. This push to cling to the belief of Santa really disturbs me. I was actually a little relieved when she stopped believing because I felt like we could get to the real meaning of Christmas with all the other stuff aside. I decided that I am going to create some kind of activity that involves the nativity that I will do with my kids daily to incorporate the Biblical account of Jesus birth and encourages daily discussion of each “character’s” role in the event. I saw online a family that started setting up the manger under the tree as Bethlehem and for the month of December each day the kids move Mary and Joseph all around the house as they travel to Bethlehem. I am going to do my own spin on it. It’s still a work in progress. Thanks for bringing up this topic. The nativity set is a great way to talk to your child about the real meaning of Christmas. It is also a chance to explain the difference between what is real and what is just fun. Enjoy the season! I think an appropriate resspnoe for the Google elves would be something like: “Google is an American company with a footprint in every nation on the planet. While many Americans celebrate Christmas, many do not both in the USA and around the world. Google is committed to embracing a holiday spirit which includes all celebrations regardless of religion or country.”Now bring on the nog. Spike it while you’re at it. Google, I am an atheist and I weodnr why you are seemingly avoiding the use of the term “Christmas” in any of your Christmas-related blog postings and advertisements.I am not Christian, but I celebrate Christmas. Christmas is a federal holiday, and has secular, pagan and Christian origins. It is a holiday that is celebrated by 96% of Americans. Please, acknowledge the holiday and try to show a bit of Christmas spirit.Thanks. Please talk to your parents or a teacher about the elf on the shelf and they will explain everything you need to know 🙂 Have a very happy Christmas! I very rarely comment on articles and such, but I suppose I felt called to do so in this case. In our home, we sure are fans of Jesus, and think his Dad is pretty awesome too. For us, it is very important to create opportunities for the kiddos to engage in authentic dialogue and personal relationship with their amazing Creator. Santa has simply been an extension of this- a man so excited about Jesus and the gift He gave the world that he (Santa) bubbles over with the desire to give as well. We’ve begun the process of teaching our children to serve others, to give to others, the joys of “being Santa” for others, and so I hope they will walk out of childhood with the beauty of Santa as an analogy for the gifting that God has given us…not as a “life altering, innocence shattering” experience. It seems to me that some of the magic could be residual holiness, you know. Besides, doesn’t “good for goodness sake” sound like grace? Respectfully rocking out a Christ centered Christmas that includes Santa. Good for goodness’ sake does sound like a good lesson for children. When we separate the conditions for the gifts from gift giving, grace wins out. Please help me I told my kids about Santa and we have been playing with the elf on the shelf and I felt uneasy about it today and I found this article today but I feel like us too late . I already done the damage. How do I fix it? How do I tell my kid that is not real and how do I do it so it doesn’t affect her spiritual life. We love The Lord and I feel very guilty and burdened about this. It is very moving to see a mom that cares enough to be burdened about these decisions for her family. If you are not happy with the way you have handled these things up to now, I would simply do what we would want our children to do; tell them the truth about how you feel. If you feel sorry, tell them you are sorry. You might tell them you were going along with what other people do and model for them how wrong it is to get caught up in that. As parents we are growing, changing people who will make lots of mistakes or just plain change our minds about what we believe. Use this change to display God’s grace to us while we are learning to respond to His leading. Please talk to them about how it is a parent’s job to tell other children about Santa and the elf. Help them to not become judgmental about what others do. Then let go of the guilt and have a very merry Christmas. I hope this helps. It really helps. Thank you so much! I agree. What I told my kids and grandkids that santa is like magic in your books. you believe it or not. The bible, God is real. The bible is real History and helps to know God. When ny son was 9. He said I dont velieve in the magic of santa anymore. We celebrate Jesus Birthday. Santa Is magic you believe it not like your storybooks. The Bible IS LIKE LIBRARY FULL OF books of history and to help us to know God. It helps us to grow as christian. Every Christmas we celebrate the. Irth of Jesus. The elf I don’t like what I understand he does naughty things…..??? ?.